What our minds perceive as “Reality” is an illusion. Vision isn’t simply the result of photons pouring into our eyes’ photoreceptors. Instead, different areas of the brain independently process a vast overflow of color, form, contour, and depth information. Then the brain edits the accumulated visual data into a simplified picture that allows us to function on a day-to-day basis. The creative process works the other way around. While the brain down-samples what is into what isn’t, artists use the same information to take what is and up-sample it to imagine what might be. Two artists who pulled it off are Franz Marc and Jackson Pollock. 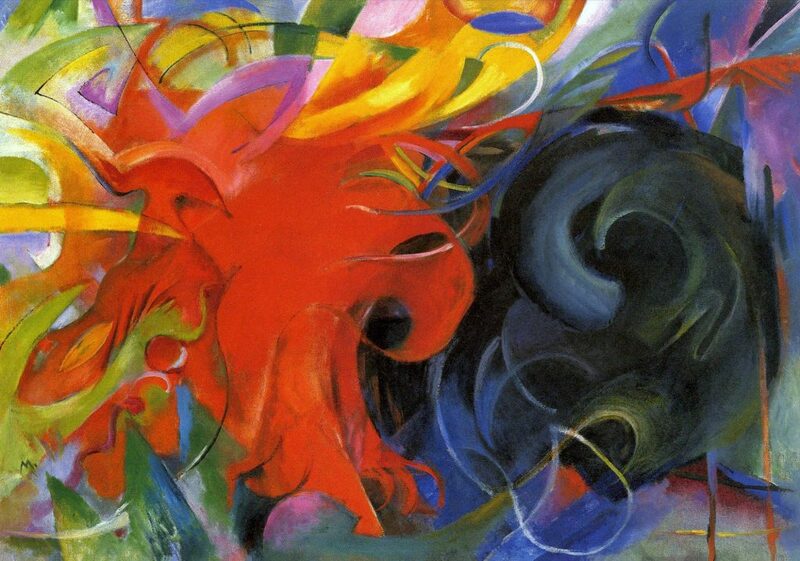 Franz Marc was one of the first artists to break away from representational imagery into pure abstraction. He died at the age of 36 in 1916 at the Battle of Verdun in World War I. If he’d lived, I think he would have been the greatest abstract painter of his time. To my eye, his most important painting is Fighting Forms, painted in 1914 (pictured above). About three feet high by four feet wide, its technique is completely traditional, however the image-space it represents is anything but. 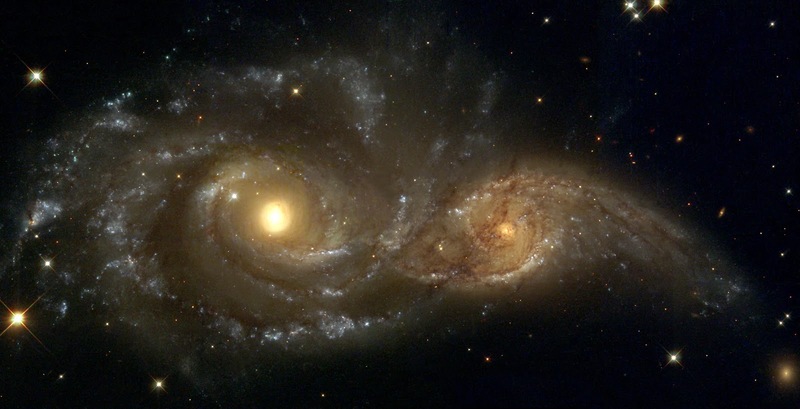 It’s uncanny how closely Marc’s Fighting Forms resembles recent photographs of violent galaxy collisions such as the one below. 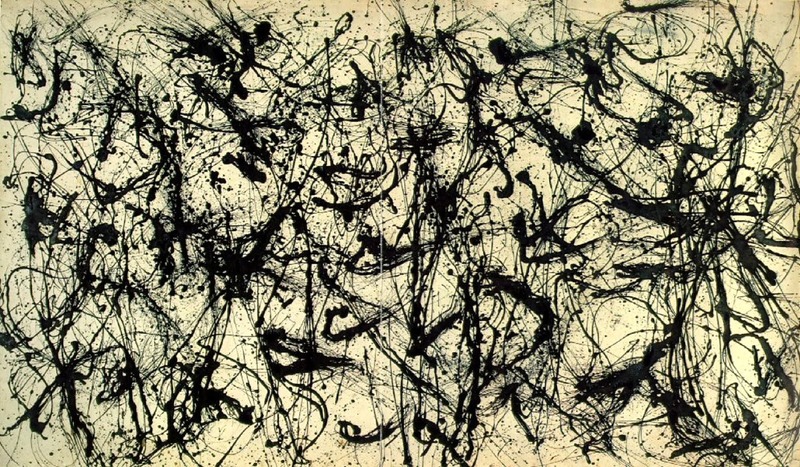 I got my first good look at Jackson Pollock’s “Action Paintings” when I was 15 at a retrospective of his work in the Spring of 1967 at New York’s Museum of Modern Art. I remember that these were the biggest paintings I’d ever laid eyes on, and that their aesthetic was different from anything I’d seen before. Unlike Marc, Pollock didn’t pre-stretch his canvases or mix paint on a palette. Instead, he tacked large canvases to the floor, and flung, flicked, dripped, and splattered the paint across their surfaces. 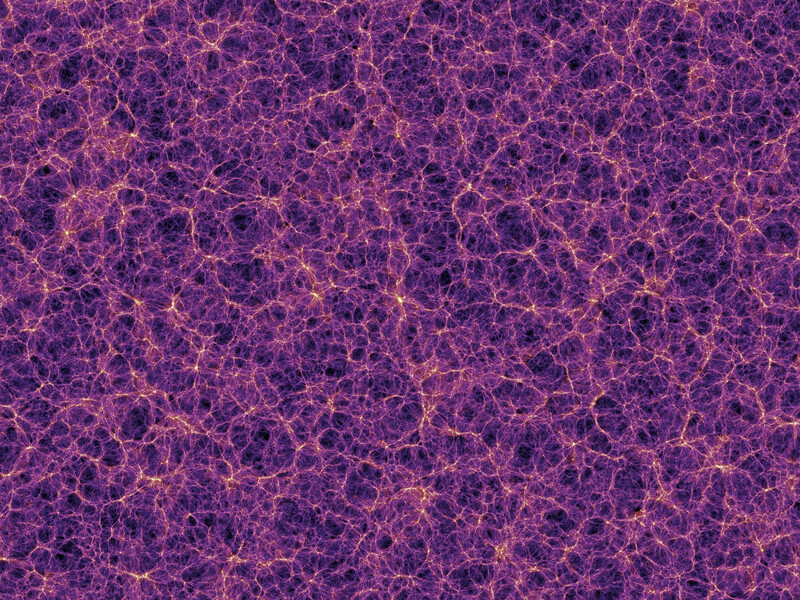 Which is pretty much how the Universe turns out to be organized, as shown in the below image from a computer simulation of the Cosmic Web created at the Max Planck Institute for Astrophysics in 2005 that visualizes 0.0000001% of the trillions of galaxies that make up the known universe.